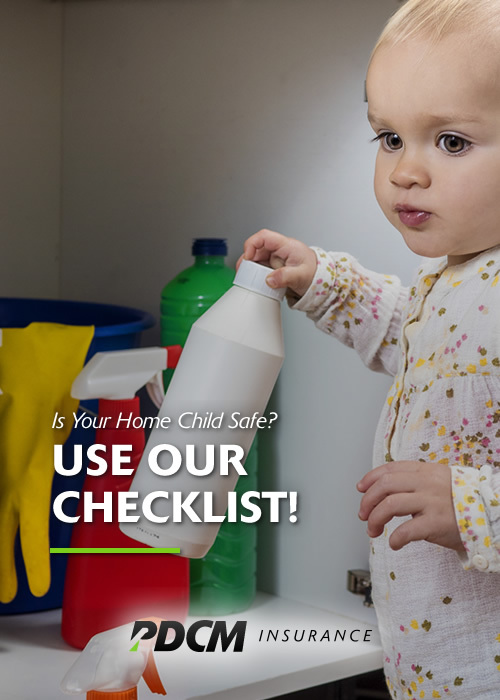 Is Your Home Child Safe? What You Can Do to Make it So. According to kidshealth.org, household injuries are one of the top reasons kids under age 3 visit the ER, and nearly 70 percent of the children who die from unintentional injuries at home are 4 years old and under. Young children have the highest risk of being injured at home because that’s where they spend most of their time. Supervision is the best way to prevent injuries, yet you can’t be with your children 24/7. (You have to work to provide for them, after all.) For peace of mind, here are some improvements you can make to create a safe environment for young ones in your home. Use back burners. Little ones love to pull themselves up on things, especially when they’re learning to stand. By using your stove’s back burners, pot and pan handles will be out of reach and out of sight. And while you’re at it, cover knobs that may be located on the front of your oven. Keep countertops as clear as possible. Kids love to pull on cords to see what they’re attached to. To prevent that, use your pantry or a cupboard to store small kitchen appliances. And it goes without saying that knives should be put in drawers and away from little hands. Use the middle of the counter. When removing pots from the stove and pans from the oven, place them on cooling racks in the middle of the counter. This will prevent children from pulling these hot containers down on them. Install safety latches and locks. com has a complete line of cabinet latches, locks and other child-safety products. Check them out to see what’s available for your kitchen. Anchor your flat-screen TV and your bookshelves. TV straps are available to anchor your TV to the wall or a TV stand. If you’re anchoring it to the wall, be sure to attach it to a stud. And the same goes for bookshelves that are taller than they are wide. Attach those to studs too. Use rugs to cover slippery floors. Hardwood and ceramic tile floors can be quite slippery. Put down a nonslip rug pad and place your rug over the top to soften the blow if a fall should happen. Install outlet covers. Putting plastic plugs in outlets used to be the way to keep children from sticking their fingers or other things in outlets. However, if the plug is removed and you forget to put it back, the outlet is exposed and the plug can become a choking hazard. You can purchase self-closing outlet covers that can help prevent mishaps. Kidsafeinc.com is just one of many retailers that sells them. Keep window-covering cords out of sight. Blinds and shades often have long cords so you can easily raise and lower window coverings. However, children can become tangled in these seemingly harmless products and strangle themselves. If possible, use only non-corded window coverings. Or at the very least, keep pull cords as short as possible, and move cribs, beds and furniture to a windowless wall. Install anti-scald faucets. The default temperature settings for water heaters range from 120 to 140 degrees Fahrenheit. If yours is set at the high end, it only takes three seconds for someone to be seriously burned. Anti-scald faucets can provide a consistently safe temperature, as can turning down your water heater’s temperature. Keep counters clear. Bathrooms are filled with hazards: prescription and nonprescription drugs, cleaning supplies, tweezers, etc. Just like in your kitchen, keep child-attractive items on high shelves and out of sight, and make sure your counters are free from such items each time you leave the bathroom. Unplug and store electrical appliances. If you use electrical appliances in the bathroom, like hair dryers and razors, be sure to unplug them and store them in a cabinet with a safety lock. In addition, an electrician can install special bathroom wall sockets (ground-fault circuit interrupters) that can lessen the likelihood of electrical injury if an appliance falls into the sink or bathwater. Limit bathroom access. Install a latch on the door at adult height so children can’t get into the bathroom when you’re not around. Also, be sure any lock on the door can be unlocked from the outside, just in case your child locks him- or herself in. Install window guards. When it’s nice outside, you probably like to keep your windows open to hear the birds and feel the breeze. Locking all the windows in the house is the most effective way to childproof them, especially since there are locks for every kind of window. Another option is to install window guards, which are grille-type protectors that work with almost any size window. Keep cribs clear. Is your child’s crib free of soft pillows, large stuffed animals, bumper pads and soft bedding? Have strings and ribbons been clipped off hanging mobiles and crib toys? All of these seemingly innocent items can lead to suffocation or strangulation, so check your child’s crib right away. Cover furniture edges/corners. Children are unsteady when they learn to walk and can often bump into furniture. And even as they grow, bumping into things while playing is extremely common. Protect your child by covering corners and edges of furniture with foam to prevent any injuries. Follow the same tips listed in “In the Living Room” above. What tips might you like to share? Are there products that you’ve found especially effective when childproofing your home? Please share them! March 3, 2016 in Home Insurance, Insurance News, Tools and Tips.